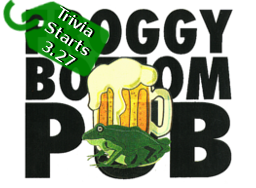 We are so excited to be hosting trivia in Foggy Bottom! Our newest venue, Froggy Bottom Pub is a neighborhood staple. The menu features American and Vietnamese favorite dishes. Trivia starts on Tuesday (3.27) so don't miss it!